P. Kay Coleman is a member of the ACS CAN Board of Directors and chair of the Society’s Desert Coastal Area Board. 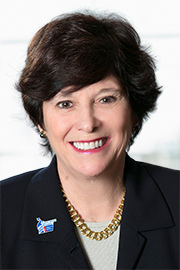 She previously chaired the Society’s former California Division, the California Division’s ACS CAN Team, the ACS San Diego Invitational and Distinguished Events, and the San Diego ACS CAN Research Event. In addition to her service to ACS CAN and the Society, Ms. Coleman serves on the Boards of The San Diego Foundation and the Westin Desert Willow Resort, and is a member of The President’s Circle at the University of Tennessee where she has endowed a softball scholarship. Ms. Coleman is a Partner and CFO of FCB Partners, LLC, a management consulting firm that specializes in helping companies become faster, cheaper, and better by implementing major changes in their processes, systems, and culture. Ms. Coleman has over thirty years of management consulting experience in strategic planning, process improvement, human resources, and sales management. Her work has covered a broad spectrum of industries including energy, consumer products, utilities, healthcare, financial services, telecommunications, pharmaceuticals, manufacturing, and educational services. Ms. Coleman earned her Master of Business Administration in Finance and Strategic Planning from the Wharton School of Business at the University of Pennsylvania in 1981. She also received a Master of Science in Educational and Counseling Psychology in 1976 and a Bachelor of Arts in English with High Honors in 1975 from the University of Tennessee.